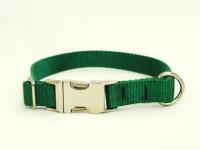 Adjustable Metal Side-Release Buckle - $11.00 : Your Pet Store, Made in the USA! High quality 3/4" wide nylon with all metal hardware. The adjustment piece and D-ring are welded metal. The side-release buckle is metal and is strong enough for even the toughest of dogs. The collar adjusts from 11-18", which will fit dogs from 15-60 lbs.